Microsoft System Center Suite: What needs an Agent update in VMM? 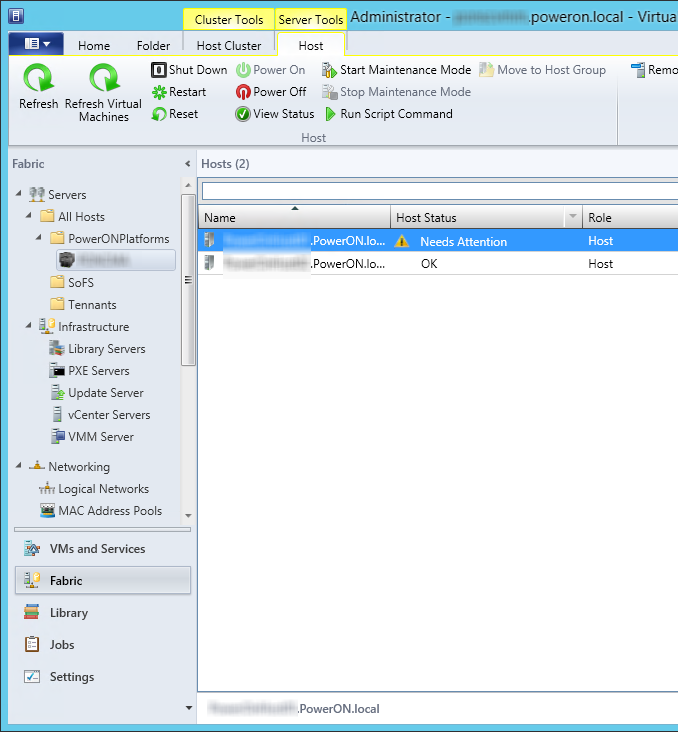 What needs an Agent update in VMM? When you apply an Update Rollup to System Center 2012 R2 Virtual Machine Manager (VMM), if you're not using plain WSUS, ConfigMgr SUS, or even the built in Update Management features of VMM, you may notice that you will see "Needs Attention" under your host status column view in the Fabric Node. Nothing to worry about, it just means there is an agent update to push. However, you will need to work through the fabric in the GUI, checking the Library Servers, PXE Servers, Update Servers etc etc. This will show you the current state of your VMM Agent deployment status. See the failed one? That's the Cluster Object Name of my library file server cluster and VMM (although it shows as having an Agent Status etc) won't allow direct update of that, only the nodes that are part of the cluster.